Ride sharing company Lyft has witnessed massive growth in its revenues in the past few years. Between 2016 and 2017, the company’s net revenues grew by nearly 45%, and reports suggest that for the first half of 2018 the company has doubled its revenue to over $900 million. Total revenues in 2017 were around $1 billion. This impressive growth is likely to drive Lyft’s valuation going forward. Based on our estimates, the company commands a valuation multiple of 10X (based on our projected revenues of around $1.5 billion for 2018 and Lyft’s latest valuation of $15.1 billion), which is much higher than Uber’s valuation multiple of around 5X (based on its valuation in February 2018). Our revenue estimates are conservative, based on Lyft’s estimated rides in 2018 (around 550 million – based on reports that the company is doing more than 10 million rides per week) and average revenue gross revenue per ride to be around $12.50. This average is based on historical data and reports suggesting that Lyft is likely to generate around $7.7 billion in gross revenues in 2018. Lyft’s net revenues are around 20% of its gross revenues. You can see the details of these metrics in our interactive dashboard on Estimating Lyft’s Valuation and modify the metrics to arrive at your own estimate for Lyft’s valuation. We have also created a more optimistic scenario in which Lyft’s revenues in 2018 reach $2 billion, which appears realistic based on its $900 million in first half revenues. Lyft grew its revenues massively during 2017, as its closest competitor Uber was plagued by controversies and scandals, and the #DeleteUber campaign led to market share pressure for the latter and a significant gain for Lyft. Lyft now claims to have 35% market share in the U.S, up from 20% around 2 years ago. 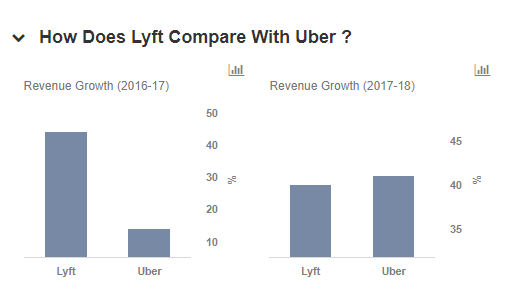 While some of this strong growth is due to Uber’s negative reputation in 2017, Lyft’s future growth prospects are bright. While Lyft will continue to grow its revenues in the second half of 2018, we expect the growth rate to be a bit lower than it was in recent quarters, as Uber works on its brand image to regain lost market share. You can modify our estimates here to see the impact on Lyft’s valuation. International Expansion : Lyft currently operates primarily in the U.S. and recently expanded to Canada, while Uber has a global presence. Accordingly, Lyft has strong growth potential in international markets. The company previously had a presence in China through a partnership with local player Didi, but it withdrew from the region. Once Lyft has its international growth strategy ready, the company can grow its revenues through a strong presence in countries outside the U.S., which could be a key growth factor in the long term. Focus On Brand Image And Company Culture: Lyft generally has a more positive image than Uber, which was faced with several scandals and controversies in recent years. Lyft is positioning itself as a “friendlier” ride sharing service in order to differentiate itself and gain share. The company’s environmentally friendly initiatives to commit to offsetting carbon emissions from every Lyft ride, as well as its pledge to offer transportation to those in need, has also helped in brand building. Further, its focus on superior customer experience and favorable terms for its drivers has also boosted Lyft. A recent survey revealed that the satisfaction of Lyft drivers is higher than those on Uber’s platform. A pool of satisfied drivers and a loyal customer base should allow Lyft to continue to drive solid growth. Technological Advancements: With companies such as Ford and General Motors having stakes in Lyft, the company is working on several mobility initiatives to improve its offerings. Last year it entered into a deal with Alphabet’s Waymo to test autonomous cars. In July of this year, Lyft acquired Motivate – a bike sharing company in the U.S. – to boost its efforts in revolutionizing urban transportation. Overall, the company’s efforts to use technology effectively in delivering a better experience for its customers should help it sustain solid growth in the future. While we do not expect Lyft to be able to sustain its 2017 growth levels going forward, it should still grow at a solid page as it invests further in improving its technology, customer and driver experience and brand image, and potentially expands internationally.